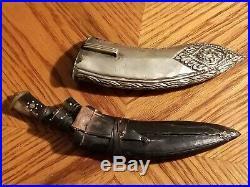 An authentic and rare hand-crafted 19th century Gurkha Kukri knife featuring an highly ornate outer jeweled silver and an inner leather sheath protecting a finely decorated blade. 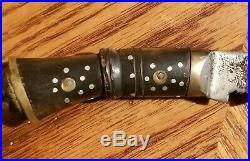 The handle is made of buffalo horn (Yak) decorated with silver dots. The end of the handle is equipped with a bronze lion head. The leather sheath has two recesses that provide space for the small Chakmak & Karda blades. The measurements are as follows. Kukhri without Sheaths: 9; Outer. Sheath: 7.5″; Inner Sheath: 7″. Blade: 6″; Handle: 3.5″. 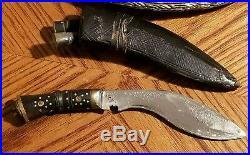 Karda Knife: 2.75. This Ghurka Kukri is complete and, for its age, in an excellent condition. Please review all photographs as an important part of the description. Please don’t hesitate to contact me with any questions or comments you may have. The item “A Rare 19th Century Nepalese Gurkha Kukri Knife with Outer Jeweled Silver Sheath” is in sale since Thursday, April 11, 2019. 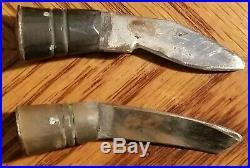 This item is in the category “Collectibles\Knives, Swords & Blades\Collectible Fixed Blade Knives\Vintage Fixed Blade Knives\Custom & Handmade”. 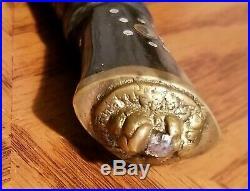 The seller is “tenkluk” and is located in Denver, Colorado. This item can be shipped worldwide. 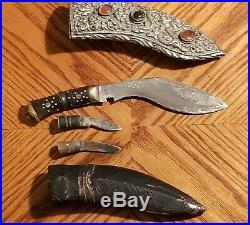 This entry was posted in rare and tagged in 19th, century, gurkha, jeweled, knife, kukri, nepalese, outer, rare, sheath, silver.